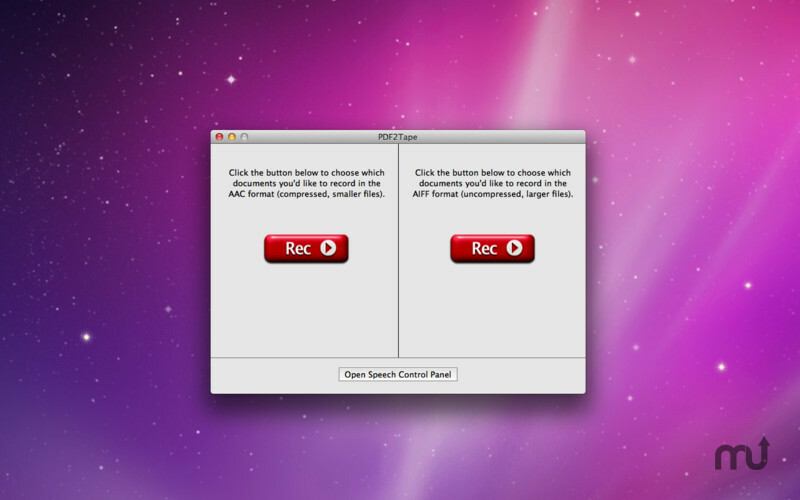 Record PDF documents to audio files. Is there a better alternative to PDF2Tape? Is PDF2Tape really the best app in Audio category? Will PDF2Tape work good on macOS 10.13.4? PDF2Tape is an application that lets you record PDF documents into audio files using the Mac's built in speech technology. Play them back on your Mac, or sync them to your iPhone, iPod, or iPad for on-the-go listening! The possibilities are endless! PDF2Tape needs a review. Be the first to review this app and get the discussion started! PDF2Tape needs a rating. Be the first to rate this app and get the discussion started! While AAC is preferred because of its significantly smaller file size, some 3rd party voices may not support it. For that reason, AIFF is included as well. Please Note: Your PDF must contain selectable text in order to be recorded. If the PDF is just an image of a document, and contains no selectable text, then it will not record. Some PDFs may have a corrupt or missing "ToUnicode" map. This will make the PDF un-recordable. If you are concerned about this with your PDF's, try this before purchasing: copy some text out of the PDF and paste it into Textedit. If the text is gibberish, that PDF will not record.